In the Mississauga–Oakville area, we are fortunate to live where both Carolinian and Boreal species are found, in some cases side-by-side; where a short drive brings us to the unique environment of the Niagara Escarpment — a World Biosphere Reserve. 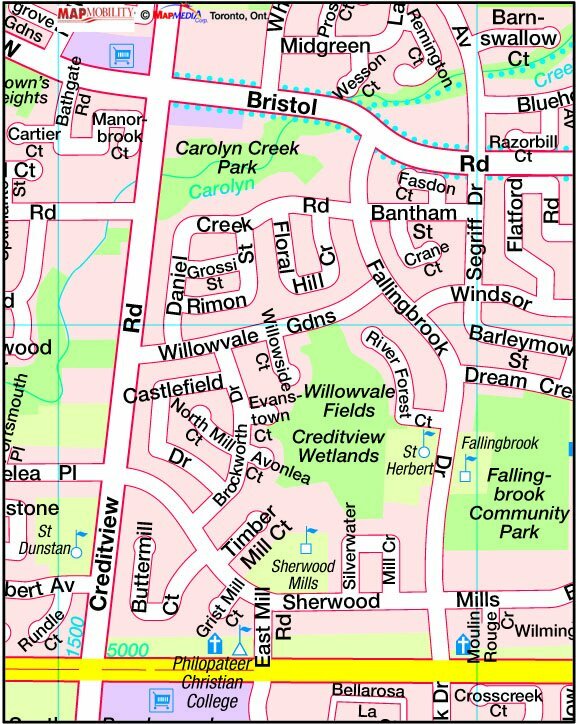 This selection of places to bird in the South Peel region (Halton and Peel Regions south of Derry Road) illustrates the simple fact that you don’t have to travel far to find interesting birding and GOOD birds. It’s hard to predict what you might find on a given outing but repeat visits over the course of time can generate very interesting lists and may even add new species to the area’s checklist. Keep us informed of your sightings. Directions to locations are noted after each hotspot description. The site maps are a courtesy of MapArt Publishing – Golden Horseshoe atlas, and were prepared by Mike Foell of the MapArt Cartographic Team and a member of our Club. The extensive holdings of the RBG offer a variety of garden plants in a beautiful setting. However, for the naturalist looking for native plants in woodland or marsh habitats, the RBG offers numerous trails to explore. For information on trails and the extensive land holdings, visit the Nature Centre. Cootes Paradise trail offers a wide variety of woodland plants, starting with hepatica, then trillium and violets in the spring, and ending with asters and goldenrods in the fall. The trail follows the water and provides interesting wetland and marsh plants: skunk cabbage, cattails, and waterlillies. DIRECTIONS: From the QEW, take Hwy 403 west towards Hamilton. Exit at Hwy 6 north (exit 93) towards Guelph. Turn right at the first lights (Plains Road) and follow the signs to the RBG Centre. Located on Spring Gardens Road near the Royal Botanical Gardens Centre, Woodlands Cemetery offers a variety of shrubs, trees, and flowers. Although few native species can be seen, it nevertheless offers an interesting variety of plants. DIRECTIONS: From the QEW, take Hwy 403 west towards Hamilton. Exit at Hwy 6 north (exit 93) towards Guelph. Turn right at the first lights (Plains Road) and follow it to Spring Gardens Road, located on the right. The marina offers birders an opportunity to view various waterfowl, but those with an interest in botany should take the opportunity to walk the woodland trails and waterside paths. Very large trees, a variety of native plants and shrubs, and interesting fungi provide the botanist with unique experience. DIRECTIONS: From the QEW, exit at Brant Street. Turn south on Brant to Plains Road. Turn right on Plains to LaSalle Park Road. 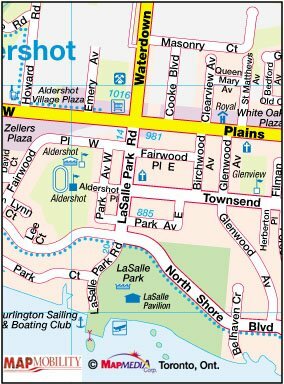 Turn left on LaSalle and follow it to the end, where the parking lot for Burlington Sailing and Boating Club is the access point to LaSalle Park. This property was originally the site of the Nelson Quarry which ceased operations approximately 30 years ago. The area is undergoing a phased restoration and development plan by the City of Burlington. It includes the stabilization of the quarry walls, creation of boardwalks across the wetland environments, and walkways through the Carolinian Forest. The City has planted native plant gardens, which are especially lovely in the summer with the rudbeckia and butterfly weed flowering. During spring the Red-winged blackbirds nest, and rails have been seen in the marsh. Located on the Niagara Escarpment with magnificent views of the city and Lake Ontario, the park has access to the Bruce Trail. A pavilion, washrooms, and ample parking provide services to visitors. DIRECTIONS: From the intersection of Brant and Dundas Streets, drive west to Kerns Road. Turn left (south) on Kerns Road to Kerncliff Park located on the left (east), just south of Dundas Street. Although managed as a recreational facility, Bronte Creek Provincial Park is arguably the best remaining example of natural habitat in the district. Visits to its varied habitats during the course of the year will yield many interesting and unusual plants. Bronte Creek divides this park into two distinct sections. West — This side of the park is a developed day-use park. Well-maintained trails give an opportunity to see woodland, open meadow, and fence row plant habitats. The edge of the valley provides a good look-out to the treed creek valley. East — Until recently, the east side of the park remained in a naturalized state. A portion of it has been developed for overnight camping. Trails along the top of the creek valley and along an electric power cut provide a variety of woodland and ‘disturbed edge’ plants. The impact of camping has resulted in multiple patches of manicured lawn in the sites but areas in between provide open or regenerating fields can still prove interesting. DIRECTIONS: For the west entrance, take Burloak Road north of the QEW to the park entrance, which is on the right. 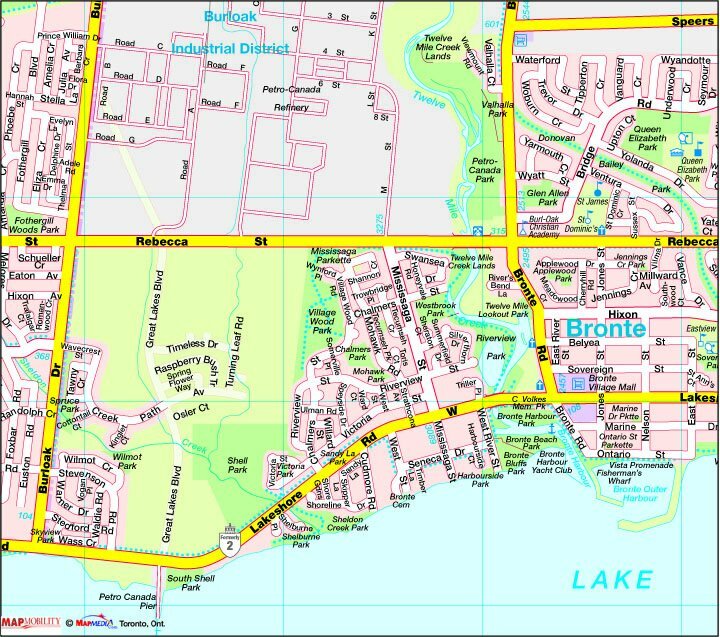 For the east entrance, take the QEW to Bronte Road, travel north to Upper Middle Road, and turn left. This is a dead end road. The campground has a day-use parking lot. User fees are in effect at the park. This small park is situated on the floodplain valley of Bronte Creek (aka Twelve Mile Creek). A soccer playing field dominates the area north of the parking lot but a variety of plants can be found around the edges of the field and by walking the trails to the north. A path also leads to and south along the edge of the Creek. DIRECTIONS: From the QEW take Bronte Road south. The park is on the right, just past Wyatt Street (between Speers Road and Rebecca Street). A word of caution: the entrance is a very narrow driveway (occasionally gated) and is easy to miss. The ravines and valleys of Sixteen Mile Creek can be accessed through the Heritage Trail system developed by the Town of Oakville. A variety of woodland and ‘disturbed area’ plants provide an interesting variety. Spring beauties, trilliums, and trout lilies (yellow and white) blend with other herbaceous plants. The highlight, however, can be viewed in early June, with clumps of twin leaf and masses of pink/blue bells of the Mertensia.virginica, or Virginia cowslip, more commonly referred to as Virginia bluebells. In conjunction with the Town of Oakville, SPNC members are cooperating to ensure that garlic mustard does not crowd out the bluebells. It is encouraging to see errant patches of bluebell plants appearing in other areas in the valley. DIRECTIONS: There are multiple access points to the trails. On the west side of the creek, there is a small parkette with parking off Skyvalley Crescent, three blocks north of Upper Middle Road on the extension of Dorval Drive. On the east side, access is off Neyagawa Blvd., 100 metres north of Upper Middle Road on the left. To the north, the trails can be accessed from Lions Valley Park via Lions Valley Park Road, just east of the Sixteen Mile Creek on Dundas Street. Rattray Marsh is a very local, easily-accessed area with a wide variety of plant habitats, from marsh/water edge to hardwood forest. Carolinian species, including sassafras and shagbark hickory, grow side-by-side with northern Boreal plants such as beaked hazel and Clintonia, or blue-bead lily. An excellent book — Rattray Marsh: Then and Now (ISBN 0-9693573-0-3) — describes many natural treasures of the marsh and the struggle to preserve the marsh. It details the various plant communities and floristic affiliations and has extensive listings of interesting and significant plant species. This book is available in most branches of the Mississauga Library System. Copies can occasionally be found at local area book stores or by calling 905-823-1572. 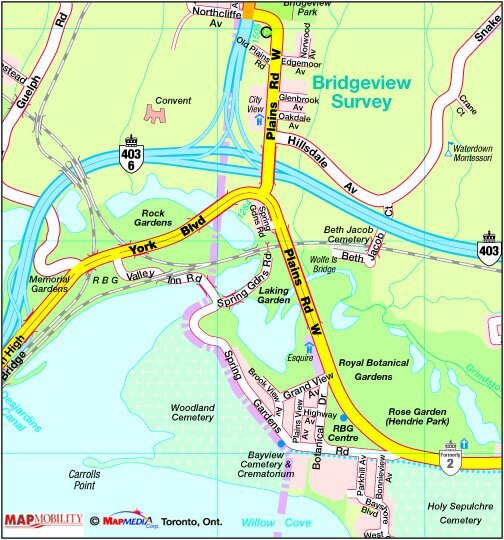 DIRECTIONS: Rattray Marsh is located on Lake Ontario, east of Southdown Road in Clarkson. 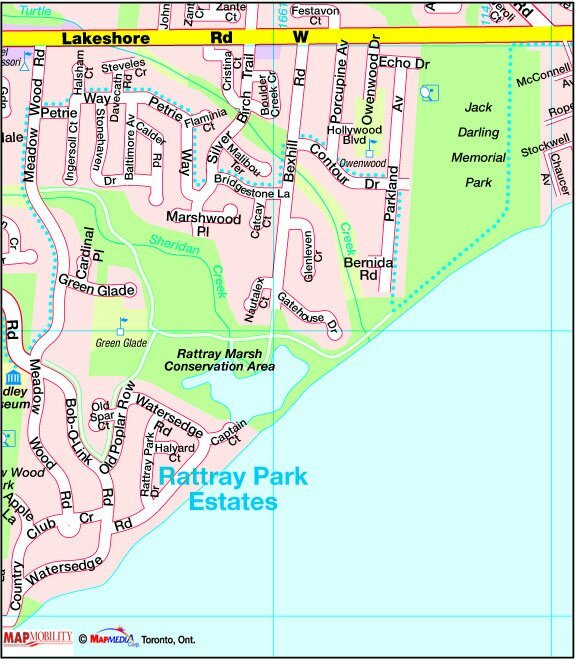 Rattray can be accessed through the neighbourhood south of Lakeshore Road at a number of spots, including Green Glade Senior Public School off Meadow Wood Road or the foot of Bexhill Road. A little further east, go to Jack Darling Park and walk west along the shore of Lake Ontario. Trails linking Sawmill Creek and the Credit River extend the natural areas on the campus to include a surprising variety of habitats at all seasons. The most direct access is to walk north from the North Building parking lot, which leads to the Principal’s residence with its groomed lawn and flower beds and then east toward the wooded trails that wander above the Credit River. 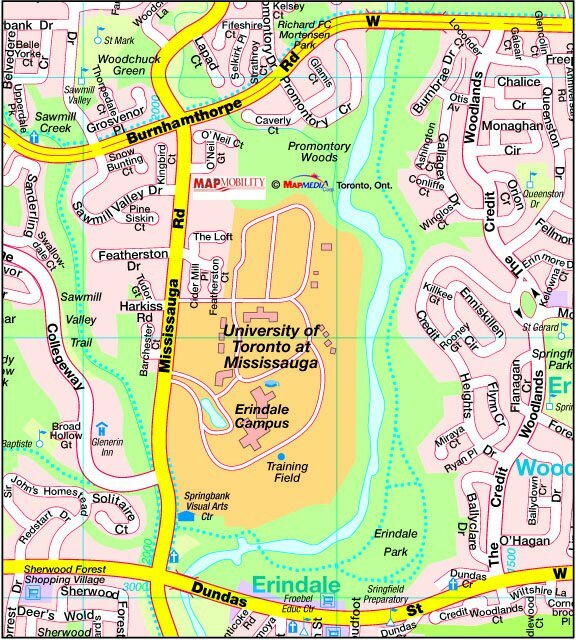 DIRECTIONS: The campus is located on the east side of Mississauga Road, just north of Dundas Street. Woodland trails along the upper west bank of the Credit River may also be accessed from the east side of the Credit River through Erindale Park, with parking off Dundas Street. After a ten year campaign, the wetland is now owned and protected by the City of Mississauga. You cannot actually visit the Creditview Wetland, as fencing protects this fragile and unique bog habitat from pedestrian and canine traffic. 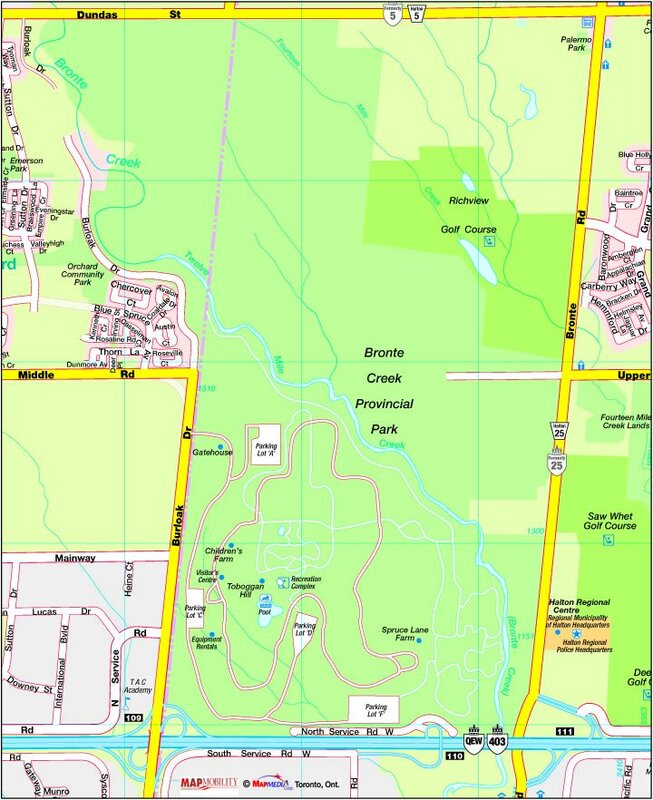 DIRECTIONS: The Creditview Wetland is north and east of the intersection of Eglinton Avenue and Creditview Road. 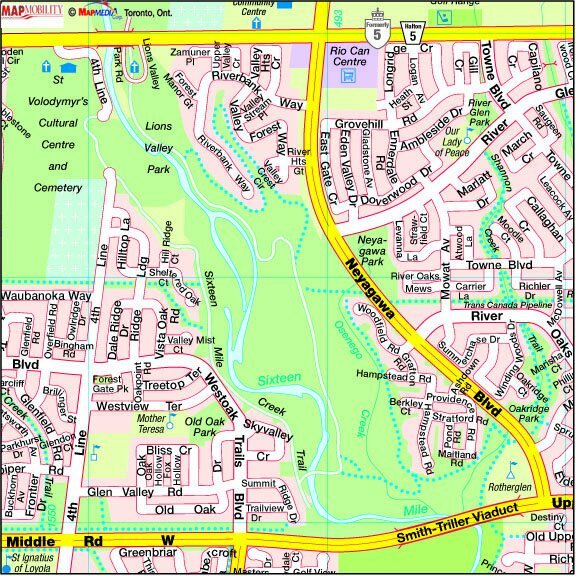 Access is from a small parkette off Willowvale Gardens, between Creditview Road and Fallingbrook Drive. A useful book is A Nature Guide to Ontario (Federation of Ontario Naturalists – 1997) (ISBN 0-8020-2755-5, or 69\802-2 for paperback edition). This book showcases more than 600 of the best sites in Ontario and provides a geological history and habitat commentary as well as listings of significant fauna species. Bruce Peninsula — During an annual visit to the Bruce Peninsula at the end of May, SPNC members explore a wide variety of habitats including marsh, fen, woodland, lakeshore, alvar, limestone rock cliffs and outcrops. Known for its orchids, May is a little early to view most of this species except Yellow Lady Slipper which can be seen growing along roadsides like dandelions. Indian Paintbrush, Lakeside Daisy (Rubberweed or Manitoulin Gold), dwarf iris, Gaywings, and Birdseye Primrose in profusion make up for limited orchid species at this time of year. Mid July provides Grass Pinks and Rose Pagonia in fen areas, while in late September these areas are blue with Fringed Gentian. Field Trip: Spring Wildflowers April 28, 2019 at 9:00 am – 1:00 pm Meet at Bronte and QEW carpool lot, Oakville Ephemerals with Audrey Oswald. The trip will end at 1 p.m. so lunch is optional. Meet at Bronte at 9 a.m. (note the late start) or Crawford Lake at 9:30 a.m. at the first parking lot. Please note that a park admission fee is in effect. Some walking, rated Moderate, Level 3. Field Trip: Warblers & Wildflower May 11, 2019 at 8:00 am – 1:00 pm Meet at Bronte & QEW carpool lot, Oakville Donna Sheppard leads this very popular trip around Oakville and Burlington. We will be looking for spring migrants: Scarlet Tanager, Pine Warbler, Black-throated Green Warbler, etc. and admiring spring wildflowers. Half-day only until 1:00 p.m. No lunch required. Moderate, level 3. For event details, see our complete calendar.